Our science Academics could be bright in their domain. Together with teachers in humanities,they are wimps. Sitting with bigots, cheering a tyrant. Only wimps and sissies: above, an example of our academic wimp and teacher in Iran. Not the best examples of informed citizens. We believe the Iranian Islamic tyranny is maintained because it can rely on a large backing of the population, since those citizens who can make a difference wimp out of their vocation, while others look on in silence and apathy. As an Iranian, one can hate the afflicting situation in which one lives but put up with humiliations as long as one’s individualistic benefits are maximised by sleaze, lies and hypocrisy. His Highness, the supreme guide and dictator, Ali Khamenei, loves to preach in rallies in which men sit at his feet and cheer him. Ali Djoun goes on drearily, in his Farsi-Arabic jargon and defective grammar, to no end. The Iranians have participated in or have heard about these rallies for the last four decades. Blasé, they show no sign of wanting something different. Iranian men are devoid of manly manners, as well as lacking great projects for their country. Regularly, by taking part in a rally for university circles organised by a theological tyrant, our professors and teachers prove that they do not consider teaching one of the highest possible callings. 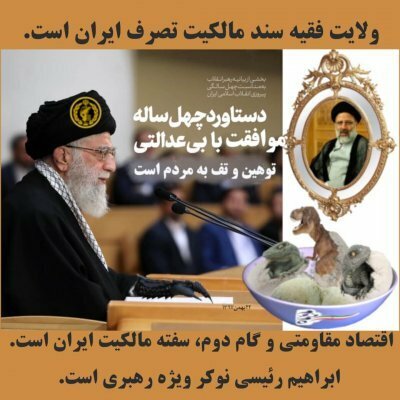 Khamenei to the Academics and Teachers: Shut up! In other words, carry on with your pipettes and centrifuges but shut up! The academic scholarly world is all about free thinking, free will and free expression in ALL domains, from science, maths and physics, to humanities. If we were to go along with theological dogmas, you – the reader – would probably not be able to read this. If it were not for the academic/free thinkers’ endeavours in introducing Arabic numbers in the very Christian West in the 11th century, today we would not have mathematics, algorithms, etc. We might even run our businesses using an abacus of the Roman numeral system. What Khamenei said to the academics MUST NOT be applauded by Iranian scholars. There MUST BE strong protests for killing the academic free spirits by Islamic censorship. There should have been fierce resistance to despotism after the students’ slaughter devised by M. Khatami, the then Iranian President, and H. Rouhani, his advisor on security matters, in July 1999. There was no protest by the academics in the past; there is none today. Will there be one tomorrow? Unconvinced? Meet students arriving freshly from Iran to register for master/PhD degrees in the West. Question them about academic spirits and freedom. Sooner or later one realises that denying realities is so much ingrained in their habits, in their mentality, that escaping from these traits and accepting the freedom of thinking may take quite a few years. Self-censorship: Covering up Their Thoughts? 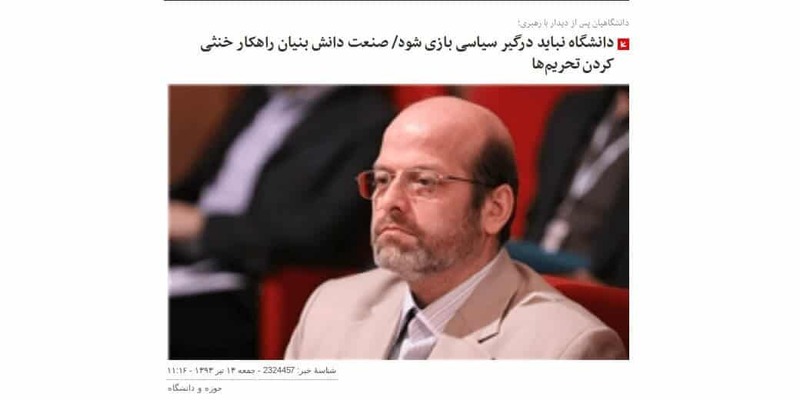 Once, in a Western faculty, a student of social sciences asked his Iranian supervisor why he never wrote a paper on Iranian affairs in his field of knowledge. He replied that, if he did, he could not remain “objective”. This answer has puzzled me ever since. Would that mean that those writers and researchers, American, Belgian, British, French, Swedish… etc., who had written on their countries’ social and political issues were subjective? Take J. Locke, N. Machiavelli, H. Zwingli. Or worse, did he want to cover up his beliefs and thoughts, whatever they were, as any Iranian is trained to do from the cradle? Every society has its own intelligentsia, which acts like a locomotive, pulling the wagons. Scholars are, by their vocation, an integral part of it. If our academics and teachers behave and chant like any untaught bassijis, as they did last week with My life for the Leader, then the prospects for Iran, for building the country, are bleak; there is no constructive driving force. Our science scholars could be bright in their domain. But they, together with our teachers in humanities, are wimps, sitting in the last wagon with unschooled bigots, cheering a tyrant.